As you may know, air quality has been a major focus of my work as mayor. My administration has been working on bringing greater attention to the issue and I’ve been advocating for aggressive, meaningful steps to that can be taken by Salt Lake City, state government, industry and individuals to help clean our air. This is a complex problem and the only way we’re going to solve it is with a comprehensive solution. Let’s come together and fix this problem right away-we can’t wait, the time for talk is over, we need to take action. Mayor Becker delivers his State of the City address on air quality to a packed house. During my recent State of the City Address on solving the air quality problem, I proposed key actions that must be taken in order to accomplish this goal. With clean air as our goal, Salt Lake City has adopted anti-idling ordinances, more than doubled our bike lanes and introduced the City’s first solar farm. For the upcoming year, we are launching the City’s first-ever multiple transit pass and are creating an incentive program to phase out wood burning stoves. Increased funding for public transit in Salt Lake City would allow for buses and trains to run more frequently. We must make it more affordable and accessible for individuals to drive less and ride more. Tier 3 gasoline has lower levels of sulfur and therefore helps decrease emissions. It is widely available to us but is not required. Mandating that it be required would provide an immediate impact on our air quality. Utah’s energy code standards date back to 2006, lagging far behind many national and international standards. Adopting an updated building code for energy efficiency would help reduce energy use and improve air quality. Gas prices have a significant impact on how much people drive their cars. Raising the gas tax would help pay for better roads while also encouraging less driving and improving air quality. Setting air quality standards tailored to Utah’s needs is imperative if we are to improve our air quality. Generic national conditions will not work in Utah, and we need to set air quality standards that will work for us. These are real solutions that will not only produce tangible differences, but produce them quickly. We have received a great response from the community, and are looking to turn that response into results. If the state is unable to do these things for any reason, I’ve asked that they grant local governments the ability to make these changes because we will get it done at the local level. Enough is enough. There are 2 things that I would ask of you in order to help improve our air quality. Lobby your legislators — Ask them to support these measures that I am bringing up and consider the other proposals that will clean up our air. If they do not support these measures, ask your legislators to grant authority to the local level, so that we can take care of our own problems. We can get this done on the local level if the state can’t or won’t. I would also implore you to work with your legislators, and not against them. To be effective and to make real change, we need to work together in a respectful and civil manner. While it is important to let your voice be heard, it is equally important to do so in a manner which conveys respect and encourages cooperation. One of the most memorable moments of my State of the City speech was when a class of 4th graders from Whittier Elementary School took the stage and sang a song they wrote about the inversion and what needs to be done. Our children are, at the end of the day, the most important reason we must strive to clean our air and these kids said it better than anyone could. Watch the video. There has been enough talk, and it is time for action. A change must be made, and it is up to each and every one of us to make that change. 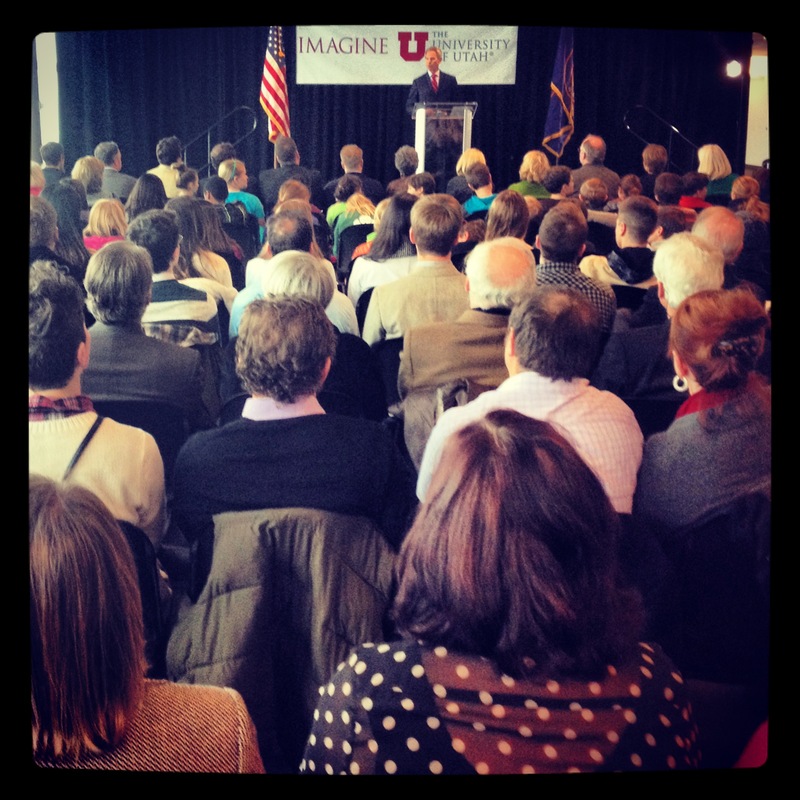 I hope you will join me in the fight to help improve the air quality of Salt Lake City. P.S. If you were unable to attend my State of the City address in person, the full text of the speech and some additional information about the issue can be found here. Also the Salt Lake City Tribune ran a terrific op-ed that discusses the ideas I laid out in my air quality address and if you’re interested, you can read it here.